In 2010, there were 31 new posts, not bad for the first year! There were 38 pictures uploaded, taking up a total of 8mb. That’s about 3 pictures per month. The busiest day of the year was August 12th with 126 views. 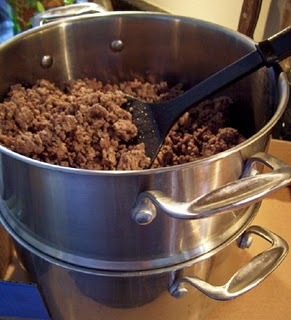 The most popular post that day was All-Purpose Ground Meat Mix. The top referring sites in 2010 were morethymethandough.com, mail.yahoo.com, facebook.com, mail.live.com, and makeupalley.com. Some visitors came searching, mostly for tortilla roll ups, apple pie, tortilla pinwheels, tortilla roll up, and apples and bananas. Sift together first seven (7) ingredients. Add shortening, brown sugar, and buttermilk. Mix till all flour is moistened. Beat two (2) minutes at medium speed on electric mixer. Add eggs; beat two minutes more. Stir in nuts. Bake in 2 greased and floured 9-inch round baking pans at 350 degrees for 30 to 35 minutes or till done. Cool ten minutes; remove from pans. Cool completely. Fill and frost with cream cheese frosting, if desired. The following recipe is not only easy and delicious, it’s also a simple way to use canned, dried, and other easily stored food items in a delicious homemade soup. Excerpted and adapted with permission from Mix and Match Recipes: Creative Ideas for Busy Kitchens by me, Deborah Taylor-Hough (this title is currently out-of-print).